What is the most money you have ever spent on a piece of fabric? Seriously, tell me the truth! From one fabric-addict to another. I promise I won't tell your husband or anyone else for that matter. I know what it's like being questioned about my bad fabric habit. I think the most I have ever spent on a single yard is about $20 plus shipping (that doesn't count, right?). And that was for Japanese imported Kawaii fabric. Over my years of dealing with fabrics I have made some interesting discoveries in my search for pretty cloth. It does not surprise me any more that some fabric designers are more sought after than others. In fact, I have come across one or two designers whose creations have become so popular that the price of their cloths has increased more than 10 times. One example is Heather Ross' fabric. I came across her cute designs a few years ago. I remember looking on Ebay and seeing people spending megabucks on cut up PJs made of her designer fabric. We are talking disassembled pants here - not even squares of fabric, people. Wow! I was shocked! 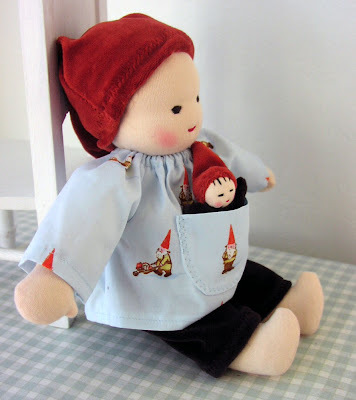 I love Heather's cute gnome fabric designs and have made many a dress with it over the years. But would I shell out well over $100 per yard to buy some of this fabric? Fabric addict or not - I THINK NOT! I simply can't afford it. So now I have a little bit of a dilemma here. A little while ago I realized that I own a few yards of these precious, rare, sought after Heather Ross fabrics. One is the blue gnome fabric. 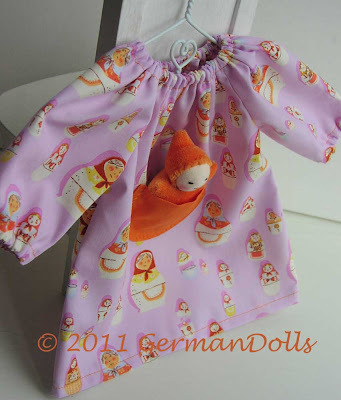 The other is the purple fabric Matryoshka print. They are both so adorable and I understand why people are after them. So what should I do? Looks like I could make some serious coin selling them off as fat quarters to people who are worse addicts than me. Should I sell them? Or should I turn them into doll clothes? And then, what would the fair price for such a doll outfit made of this rare fabric be? My inclination is to keep the fabric and to use it the way I intended to use it when I first bought it. After all, I am not a fabric seller...I'd appreciate some opinions on this topic! Do not cut unless to sell pieces. Your work is adoreable enough without using that expensive fabric. Personally, I spent $350 for 5 yards of wool plaid kilt fabric last year. It was shipped from Scotland. AND then we didn't need it, but I was able to sell it for the same price!! Other than that $22/yard for silk for some curtains once. What a dilemma! I would not sell it - I would make doll clothes from it, and price it accordingly. hmmmm how much would you sell a fat quarter for???? I think I´d sell... when something is so much worth you can have a great deal here. That's business I think:) BUt I can understand your dilemma. If the fabric is worth megabucks I'd sell it as fabric. Option A: Keep and use and some lucky customers get some cute prints on their dolls. Option B: Sell at the going high rate and buy yourself an on-sale airline ticket and go on a trip for a week to Germany. I think if you are looking on a selling stand point, would your buyers understand the "price" of the fabric? 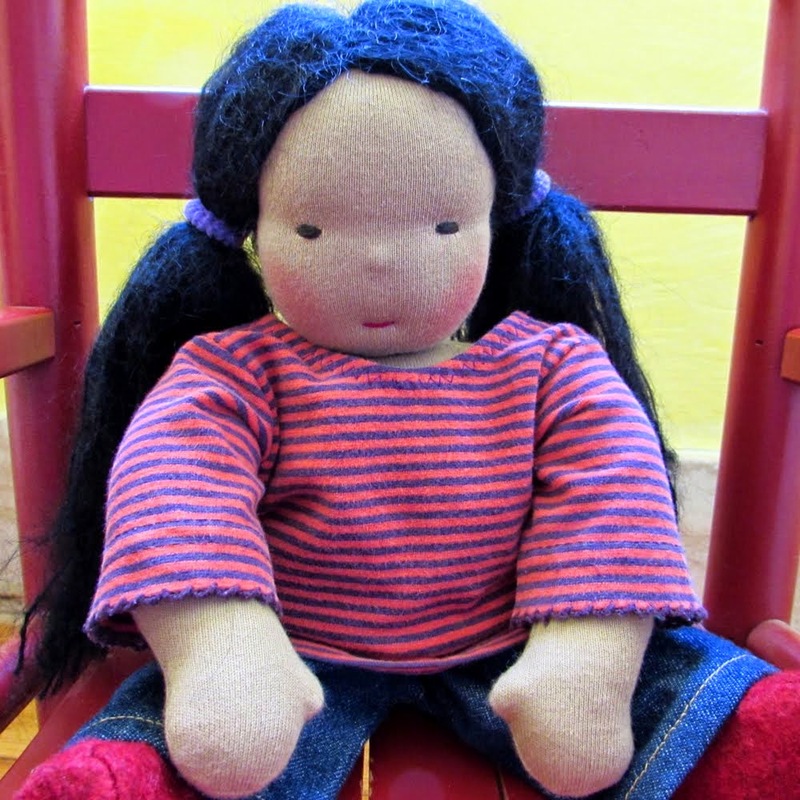 If you have buyers for the true price of the fabric then make the doll clothing, if not sell it! Don't know if I helped!! I think I will probably go to selling the fabrics with dolls ONLY. That way people know they get a very special doll indeed! I would sell the fabric. I love Heather Ross fabric and we have a red/yellow gnomie doll dress. Honestly I do spend a lot on doll clothes and I love that dress (my rainbow doll practically lives in it) but I would have never paid more than $30 for it. So what I think is you will find other beautiful fabric and people will love it too. If you can make some money out of a fabric (to buy more fabric/supplies) and you don't want that fabric for you I would totally sell it. Thanks for letting me know the customer perspective! It really helps!